While recycling trash is preferable to simply chucking refuse into the dump, the process still creates tons of byproducts that end up making their way to the landfill. 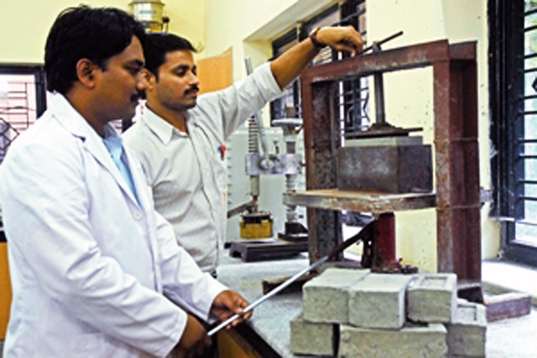 Fortunately, Professors Rahul Ralegaonkar and Sachin Mandavgane of the Visvesvaraya National Institute of Technology in India (VNIT) have developed a way to create paper bricks from recycling waste. Made from 90% recycled paper mill waste (RPMW) and 10% cement, the mixture is mechanically mixed and pressed into molds and then cured in the sun. The brilliant recycled building material is low-cost means of eking more efficiency out of an already good practice. After visiting a recycling plant in 2009, Mandavgane and Ralegaonkar discovered that 15% of the paper taken in was left to sit in a landfill as sludge. After bringing the slurry back to their labs at VNIT, they experimented with a mixture that would make a good building material. Their bricks are made from 90% recycled paper mill waste that has already been used successfully in false ceilings and partition walls. In addition to paper waste, the team has incorporated textile effluent treatment plant (ETP) sludge, cigarette butts, fly ash, cotton waste, polystyrene fabric, waste tea, rice husk ash, granulated blast furnace slag, and dried sludge from a waste water treatment plant. “Recycle Paper Mills (RPM) contribute 30 percent of [the] total pulp and paper mill segment in India. With 85 percent being the average efficiency of RPM, 5 per cent waste (RPMW) is produced annually. RPMW which otherwise is land filled has been utilized to make construction bricks that serve a purpose of solid waste management, new revenue generation and earning carbon credits,” says Mandavgane. 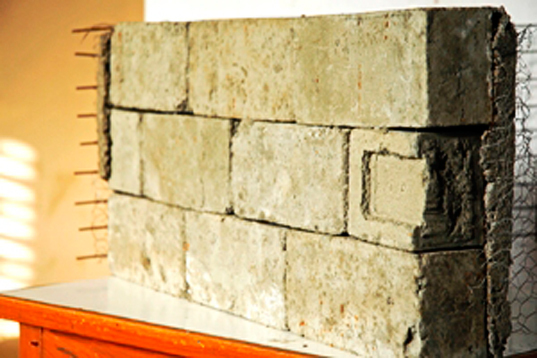 Blocks made from these cast-off materials are half the cost of normal bricks and much lighter. Such inexpensive bricks would come as a great benefit to the Indian construction market, which has a 30% deficit in supply. The team is presently working on a waterproof coating for the bricks (so they can be used on housing exteriors) and determining the material’s efficacy in earthquake prone areas. Have you applied for patent. In days of depleting natural resources a perfect example of productivity from watse This will help the construction industry especially rela estate to reduce the cost and if the strength acquired is same as conventional bricks it will go a long way to replace them and Lot cost savings Can be acheived. Congratulations to the researchers on this remarkable innovation to recycle waste product into an eco-friendly product. What about the effects of hazardous material in the effluent treatment plant (ETP) sludge, cigarette butts, fly ash, cotton waste, polystyrene fabric, waste tea, rice husk ash, granulated blast furnace slag, and dried sludge from a waste water treatment plant??? Isn't there a danger of spreading these particles in the environment where bricks are installed over the period of years?? What are flammability? I see no mention of fire retardation. Also see a related technology widely deployed in Africa: http://www.goodearthtrust.org.uk/technology.html These bricks are made of cement stablised soil. Their other key feature is that they are of interlocking design which greatly improves the strength of walls, buildings, water tanks, etc. Perhaps the waste paper blocks could adopt that feature? Can you purchase the bricks now? If so, how and where?